Mother Bee Soothe And Protect Cream For Horses and ALL Animals in a 280ml tub. 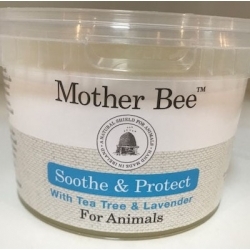 The Mother Bee Soothe And Protect Cream contains a mix of Beeswax, Tea Tree and Lavender. Mother Bee Soothe and Protect Cream soothes all itches or sores. It will heal the site of the problem and the unique effect of the beeswax protects the skin but leaves it breathable. This ‘Fix All’ in a tub will soothe sores or abrasion on any animal. The exclusive recipe of Beeswax, Vitamin A, B & E, Lavender, Tea Tree and Camphor repairs the skin and provides a protective barrier whilst allowing the skin to breathe and regenerate. The natural antibacterial properties have benefited horses with severe mud issues, skin irritations, rubs, cuts and abrasions whilst soothing inflamed and sore skin. 100% Natural. Beautifully Handmade in Ireland. It is FEI Legal as well.